To make the grounds as attractive as possible for a lawn party given one night, I constructed an electric fountain which at first appeared to be an expensive proposition, but when completed the desired effect was produced without any expense whatever, as I had the things used in its construction on hand. A light frame, 9 in. square, was made, of 3/4-in.material, as shown in Fig. 1, and a grooved pulley was attached exactly in the center on the under side of the crosspiece. A turned stick, A, 2 in. in diameter and 21/2 in. long, was fastened to the face of the pulley so that it turned true as the pulley and frame revolved. A hole was then bored centrally through the three parts, the frame crosspiece, the pulley, and the turned stick, of a size to fit a spindle about % in. in diameter. A box was procured. large enough for the frame to turn in freely, and a block of wood was fastened centrally in its bottom, which had a 3/8-in. pin set in a hole bored in the center. The pin may be of hard wood, but it is better to use metal. A bolt, or piece of rod, will answer the purpose of a pin very well. A small battery motor - I had one on hand and did not need to purchase one - was fastened to one side of the box so that its pulley was in line with the pulley on the lower surface of the frame. The batteries to run the motor were placed in the corner of the box, where the evolving frame would not touch them. The motor may be of larger current capacity, however, and run direct on the current used for the lamps. About 1/2 in. from the lower end of the turned piece A, a brass strip was fastened around it. This work should be neatly done, and the joint soldered and smoothed, so that the outer surface will not catch on the brush used to make the contact. This ring can be better made by cutting the width from a piece of brass tubing of a size to fit on the turned stick A. About 1 1/2in. from the lower end four segments of a circle were fastened so as to make a space of about 1/4in. between their ends. This construction is clearly shown in Fig. 2. 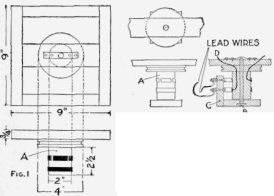 A cross section, showing the wire connections from the brass ring and segments to the lamps and where they lead out on top, is shown at B. The contact brushes consist of brass strips fastened with bolts to an upright, C, made of wood and attached to one edge of the block in the bottom of the box. Two nuts are used on each bolt, between which are fastened the lead wires from a source of current. The wiring diagram is shown in Fig. 3. The wire D from the ring is run to the brass base of each lamp, of which there are four. The wires E, from each segment, are connected with solder to each screw ferrule of the lamps, and the ends are left bare and open, as shown, between the lamps. A lamp is fastened to each corner of the frame on top, as shown in Fig. 4, with a piece of wire wrapped once around the screw ferrule and the extending ends held with staples. The wire used should be heavily insulated or, if it is of iron, a rubber tube slipped over it. A piece of tin, or bright metal, is placed beneath each globe for a reflector. A glass plate was used to cover the box, and a lawn spray of the fountain type was placed on the glass. The globes, as they light beneath the spray, illuminate the top and the light follows the streams of water so that they appear like streams of light. Each light is turned on in succession as the frame revolves within the box, and by using globes of different colors, an exceedingly beautiful effect is obtained. If the bared ends of the wires are twisted together between the globes, these will all glow at once.